Here at Reef Dispensary, we get asked numerous questions about our products on a daily basis. One of the most popular topics of interest are edibles, those cannabis infused treats that allow you to discreetly eat marijuana rather than smoke it. We’ve put together this handy guide to help you find the right products and to help answer some of those frequently asked questions. Bon Appétit! Quite simply, cannabis edibles are any product that can be eaten which is infused with compounds from the cannabis plant. Edibles are a wonderful alternative delivery method of marijuana, but they have some important differences from other common means of consumption such as smoking or vaping. 2. What are edibles used for recreationally? Medically? Many edible consumers enjoy using edibles for the same reason that they like smoking cannabis traditionally, as it helps with things like relaxation, sleep, mood, or pain relief. Added benefits of edibles are that they are more discreet, not giving off the smell of marijuana or the appearance of smoke like traditional cannabis consumption methods do. Edibles may contain the famous psychoactive THC, the non-psychoactive CBD (cannabidiol), and/or a variety of other cannabinoids and terpenes. 3. Will edibles get me higher than smoking marijuana? Of course, that all depends on the dosage. But edibles can be sneaky and creep up on you, with an onset up to 2 hours or more after consumption. Most edible consumers describe the effect as a different kind of high than other consumption methods, which may be described as a body high. Many people experience a “stronger” high, per milligram, from edibles than from other methods. 4. That tasted great! But I don’t feel anything. Should I have another edible? When starting out with edibles, just remember the classic Beastie Boys song: “Slow and low, that is the tempo.” Because THC edibles can take up to two hours for the psychoactive effect to kick in, you will want to take it slowly and start with a low dose, as edibles can hit pretty hard when they take effect. If after two hours you feel like you could handle more, then feel free to take another. 5. What kinds of foods are typically infused with cannabis compounds to make edibles? While traditionally edibles were popularized as a homemade treat (as in the [in]famous weed or pot brownies), today edibles are commercially made in every state with a legal medical or recreational cannabis program. Edibles are sold in various forms, such as crispy rice treats, chocolates, cookies, gummies, dried fruit, capsules, syrups, oils, tinctures, lozenges, and even drinks! 6. How are edibles made? Traditional edible recipes are as varied as the stoners who have messed around with bud in the kitchen, but the most common infusion method for baked edibles, such as cookies or brownie bars, is to make the recipe with cannabis infused butter (or substitute another fat such as coconut oil). Alternatively, gummies may either be sprayed (stay away from these if you can) or infused with a cannabis extract such as pure THC distillate. Infused gummies are more consistent when it comes to dosage, and some states have even banned the spray method. 7. Does Reef make its own edibles? Yes, we do! Reef produces all of its edible products under the Tryke Edibles and Bake Sale brands, which includes lozenges, gummies, chocolates, tinctures, syrups, and other products. If you would like to consume cannabis edibles but do not want the added calories or sugars of the sweets that are usually medicated, try tinctures. Tryke offers tinctures in CBD, THC, and 1:1 CBD/THC. Sold as an oil with a dropper, tinctures can be a great way to get the edibles effect. Your body can even absorb the cannabis faster if you hold the tincture droplets under your tongue for absorption. 9. What third-party edible products does Reef carry? In Nevada, Reef carries edibles of every type, from trusted brands such as Cannavative, Evergreen Organix, Canabella, Oleo, Provisions, EPC, Qualcan, Polaris, Flasq, Trokie, Atlus, Kiff, Dixie, and more. In Arizona, we offer products from Amy & Al’s, K.I.N.D., Baked Bros, Sublime, Trokie, Vital, Keef Cola, and more. All products are subject to availability. 10. What is the difference between medical and recreational edibles in Nevada? As far as the product itself goes, medical and recreational edible products in Nevada are made from the same ingredients. However, Nevada law requires that recreational edibles are maxed out at 100 mg per package and 10 mg per dose. However, medical edibles can exceed the recreational limits, allowing items like 1000 mg chocolate bars to be sold to medical card holders. Anything above 100 mg in Nevada is considered a medical-only edible and by law cannot be sold to recreational customers. 11. Is there a difference between Indica edibles and Sativa edibles? Although we tend to see products marketed as “Indica edibles” or “Sativa edibles,” there really isn’t much difference. While it is true that edibles made from cannabis butter can retain the traits of the original Indica or Sativa flower, many edibles are instead made by extracting the THC from the plant. During this process, the terpenes – the individual compounds that determine the cannabis flower’s smell and effect – are stripped away, keeping only the THC in tact, leaving the Indica or Sativa properties behind. However, most edibles will give you a body high that will make you feel relaxed, similar to an Indica. If you are looking for an uplifting high that is usually associated with Sativas, we suggest looking at edibles made with coffee products or ones that contain added caffeine. 12. Is it legal to consume edibles in public in Nevada? In Arizona? Although edibles look just like regular food and are unlikely to be detected if consumed in public, public consumption of cannabis in any form is not permitted in the state of Nevada. Arizona does allow public consumption of medical marijuana edibles, as long as you are not operating a vehicle, heavy machinery, or doing anything that could be considered negligence if you are intoxicated. 13. I am curious about edibles, where should I begin? 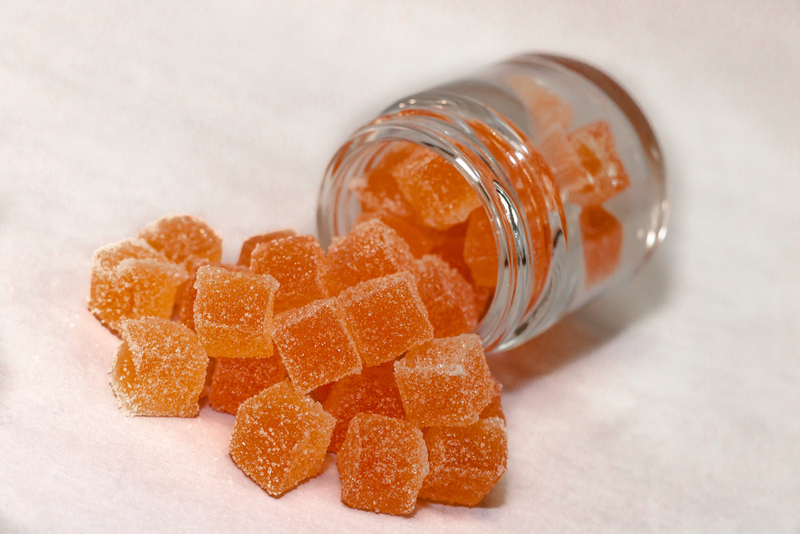 If you are looking for a psychoactive high, we recommend starting with a small dose, such as one 5 mg or 10 mg THC gummy. If you are seeking the medicinal benefits of CBD without the “high” feeling, look for a CBD gummy, which will allow you to consume even 1000mg without the psychoactive effect. Tryke and many other companies also offer 1:1 CBD/THC gummies, which contain both THC and CBD in equal amounts, or even other ratios, which can each give you a different feeling due to the interaction between compounds, known as the entourage effect. 14. I just ate a 1000mg edible, several hours have passed, and I don’t feel a thing. How much more do I have to eat? You may be in the rare group of people that are not affected by edibles. Strangely, some people cannot feel the accompanying psycho-active effect of THC-infused cannabis edibles. 15. Help! I think I overdid it and took too many edibles and now I am too high and am panicking! What should I do? This is a common mistake that many people make when they consume edibles. Here are a few tips to help you through this type of situation. b) Drink plenty of water: You’ll want to stay hydrated and avoid dry mouth, so drink plenty of water. Do not drink alcohol, as this can increase the psychoactive effect of the THC in your system. c) Black pepper: Strangely enough, black pepper has the power to counteract the THC in your system. This home remedy works because the natural terpenoids in pepper react with the cannabinoid receptors in the brain, providing a calming effect. Chew a few black peppercorns or simply whiff some black pepper under your nose and it should help calm you down. d) Deep breathing: Just as meditation can help whisk away negative thoughts and relax you when you are in a regular state of mind, it can also help calm you down after a stressful edible trip. Sit comfortably, close your eyes, and take long, deep breaths – in through the nose, out through the mouth – for an extended period of time to help ease any anxious onset. e) Sleep it off: Sometimes you need to just let the high take its course. One of the best ways to do that is to simply sleep it off, which can seemingly pass the time quicker. Bonus: you may have some interesting dreams! f) Take a Walk: We don’t recommend rigorous exercise or trying to operate fitness equipment when you are in a state of paranoia, but sometimes a walk outside in a safe, familiar area with little traffic can help clear your head. This is not recommended if you are having trouble keeping your balance or walking in the first place. g) Do something else: Watch a movie, play a video game, read a book, or listen to some music. Occupy your mind with some other type of entertainment that will help you avoid pacing around the room and overthinking your life choices. 16. Can CBD be used to counteract anxious feelings stemming from edible use? Since CBD is often used to quell anxiety, many swear that administering CBD can counteract any feelings of anxiousness or paranoia that arrive from taking too many edibles. We recommend only using trusted, lab-tested CBD products and if you are trying to come down, be sure that you are taking a pure CBD product, not a CBD/THC blend. 17. Why did that infused gummy I ate taste a little bitter? You are likely tasting the THC or CBD extract that has been added to the gummy product. 18. Are edibles safer than smoking cannabis? That depends on how you look at it. On one hand, consuming an edible product avoids any potential danger that might be attached to inhaling smoke. However, since edibles can be much more potent than smoking cannabis, you may be struck with an anxiety attack if you eat too much. Vaping is a great consumption method if you are concerned about any issues related to cannabis consumption. 19. Can you die from overdosing on edibles? There has never been an overdose death recorded from consuming cannabis in any form. 20. Why have hospital visits increased in areas where cannabis has become legal then? It should be noted that in Colorado, for example, at least half of these reported marijuana-related ER visits have found other drugs in peoples’ systems, such as meth or cocaine, according to an NBC report. Often times, people do not know what to do after accidentally ingesting edibles or consuming too much cannabis. Distraught, they head to the ER, rather than letting the effect simply wear off naturally. 21. Are edibles marketed to children? Edibles are not meant for children whatsoever. Particularly, the state of Nevada has implemented a series of measures to see that edibles are not marketed to kids or mistaken for regular food. For one, all edibles must be packaged in opaque packaging in which the product is not visible. Additionally, edibles may not use familiar “parody” logos of popular products, nor can they contain cartoon characters, animals, fruit, toys or anything else that on their packaging that might appeal to children. In fact, edibles are not even allowed to be called “candy,” even if they are cannabis infused gummies. While these safety regulations belong to Nevada, we think that this will be the blueprint for other legal cannabis markets as they come online. 22. My pet accidentally ate my edibles, what should I do? First, find out what kind of edible your pet ingested. Even non-medicated chocolate by itself can be fatal for dogs, so best to take a trip to the vet if your dog has eaten your infused bonbons. Otherwise, administering activated charcoal orally can help counteract any toxins in your dog’s system. In most cases, your little one will be fine and the cannabis will run its course, eventually wearing off. Just be there for your pet throughout the process and keep them hydrated. If that doesn’t work, then you may want to see the vet. 23. Where should I store my edibles? Treat edibles and all marijuana products just like you would other over-the-counter medications or intoxicating alcoholic beverages. Keep them safely out of reach of children or pets. You may also want to avoid areas where they could melt. 24. My marijuana edibles have melted together! Does this affect the THC / CBD dosage? Unfortunately, without re-testing the products, there is no way to tell if the dosage has been affected, but if they have fused together, more than likely yes. Best to dispose of them, unless you aren’t concerned with controlling the dosage and just plan to eat the giant, melted gummy like some kind of gluttonous heathen. 25. Can I travel out of state with cannabis edibles? Although edibles look just like regular food and are unlikely to be detected, it is federally illegal to travel across state lines with edibles or any other marijuana product.